The debut of Lauren Bacall and her first teaming with Humphrey Bogart are the highlights of To Have And Have Not, a story of romance and intrigue during the early days of the Seconds World War. Almost a remake of Casablanca, To Have And Have Not is distinguished and enlivened by the sharp sparring between Bogart and Bacall playing two self-centred characters unable to resist falling in love in a foreign land. It's 1940, and the French Caribbean island of Martinique is feeling the shockwaves of the war in Europe. The Nazi-friendly Vichy government is in control, and looking for skulking Free France agents. American Harry Morgan (Bogart) minds his own business running a fishing boat while living at the Hotel Martinique, but in one day his neutral life is severely disrupted: Marie Browning (Bacall), a young American travelling alone, arrives in Martinique and moves into the room next door, and Frenchy, the hotel owner, seeks Morgan's help to smuggle some Free France activists. Morgan calls Marie "Slim", she calls him "Steve". Sparks fly between them. Initially reluctant to help Frenchy, Morgan finally agrees to undertake the smuggling mission, primarily to make enough money to help Slim leave Martinique. But she decides to stay with him and they both become involved in helping Free France agents, as the local authorities close in. Director Howard Hawks and screenwriters Jules Furthman and William Faulkner did not leave much of Ernest Hemingway's novel intact, which is likely a good thing, Hawks claiming that Hemingway himself said that the book, set in Cuba, was "a bunch of junk" . Instead, Hawks set out to recreate as much of Casablanca as he could. Fort de France, Martinique is a fine alternative setting for an exotic port city during the war, and most of the other To Have And Have Not plot elements are not-so-subtle imitations of the legendary story of Rick's Cafe Americain. From the busy lounge to the piano player to the French resistance seeking Bogart's help all the way down to the local French lawman's name (Renard as opposed to Renault), To Have And Have Not aims for flattery by close imitation. 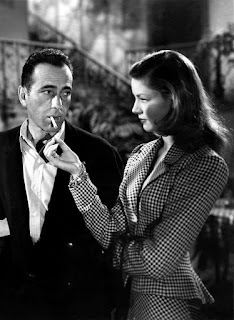 Despite lacking in freshness, fortunately this retelling of essentially the same story does stand strongly on its own thanks to the talent involved, and the strength of the one main original component: the relationship between Bogart's Captain Morgan and Bacall's Slim. Bogart was 44 at the time of filming, Bacall was 19, and remarkably, Slim became the first female screen character to equal the cool arrogance and inexhaustible self-belief of the Bogart persona, and Bacall the first actress to match Bogart's sheer captivating screen presence. The two were made for each other on and off the screen, and in To Have And Have Not, it does not take their characters long to find this out. The film sparkles during the many scenes in which Morgan and Slim match wits, as they jointly arrive at the conclusion that they belong to each other despite both possessing forceful streaks of individualism. The rest of To Have And Have Not gallops along with a well-rehearsed agility, Bogart's magnetism overcoming secondary characters that are game but not as sharply defined or as memorable as their Casablanca counterparts. There is too much of Walter Brennan's drink-obsessed Eddie and not enough of Dan Seymour's sturdy Renard, nor does Dolores Moran get enough to do, several of her scenes apparently excised in favour of shining a brighter spotlight on Bacall, despite Moran carrying on an affair with Hawks during filming. To Have And Have Not is Casablanca through a just slightly distorted mirror, but emerging through the smoke and on the screen is a simmering love story between a young ingenue and a grizzled legend, with a passion that both overshadows and elevates the film that spawned it.